Gold fell more on Monday than all of last week as investors flocked to the U.S. dollar and stocks and shunned commodities. Gold for December delivery fell $22.10, or 1.3%, to $1,737.60 an ounce on the Comex in New York. Intraday prices ranged from a low of $1,729.70 to a high of $1,755.50. Gold prices fell 0.6% last week. "Gold’s lack of follow-through on its recent rally is leading traders with itchy trigger fingers to sell," MarketWatch quoted Brien Lundin, editor of Gold Newsletter. "It’s going to be difficult for gold to mount a sustained upward move until after the presidential election provides some clarity as to the direction of U.S. economic policy going forward." Silver for December delivery plunged 92.6 cents, or 2.8%, to $32.743 an ounce. It moved between intraday prices of $32.57 and $33.47. Platinum for January delivery settled to $1,632.30 an ounce, falling $27.00 or 1.6%. Platinum traded between $1,623.00 and $1,658.00. Palladium for December declined $6.45, or 1.0%, to $632.60 an ounce, ranging from $624.00 to $643.10. Precious metals losses last week were 2.6% for silver, 2.8% for platinum and 3.6% for palladium. Losses last week were 1.0% for gold, 3.0% for silver, 1.9% for platinum and 2.5% for palladium. Monday’s are typically among the best sales days for U.S. Mint bullion coins. That has not been the case in October. 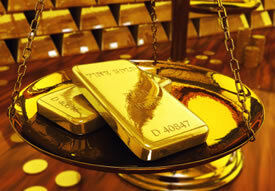 For a third straight Monday, the U.S. Mint reported no gains for any of its bullion products. What a perfect headline for Jon Nadler of Kitco fame (or infamy?). Or did he give up posting under his own name? When will he become a precious metals bull instead of bear? Even his perennially bearish British counterpart, John Dizard, is calling for a 1979-1980 style gold blow off. Should be fun. Unless you’re short, Jon!